Many who are looking to lose weight have chosen to cut carbs and sugars from their diet as a means to live a healthier lifestyle. So many things we might not even expect are high in carbs, so it is natural to want to know how many carbs in balsamic vinegar there are. Carbs, particularly refined carbs that come from things like white bread and simple sugar, have been shown to cause insulin spikes in the body leading to problems with weight gain and even increasing the risk for the development of Type 2 diabetes. Living a low-carb lifestyle does not mean that you no longer get to enjoy your favorite foods or that you are doomed to a life of limp vegetables with no flavor. There are tons of carb friendly condiments that provide a lot of flavor bang for the carb buck. All it takes to find these alternatives is a little know-how and a willingness to read food labels. These skills will help you make healthier choices while still being able to enjoy your favorite foods. Salads can be flavorful, BBQ still enjoyable, but these things also don't have to be loaded down with added sugar and carbs. 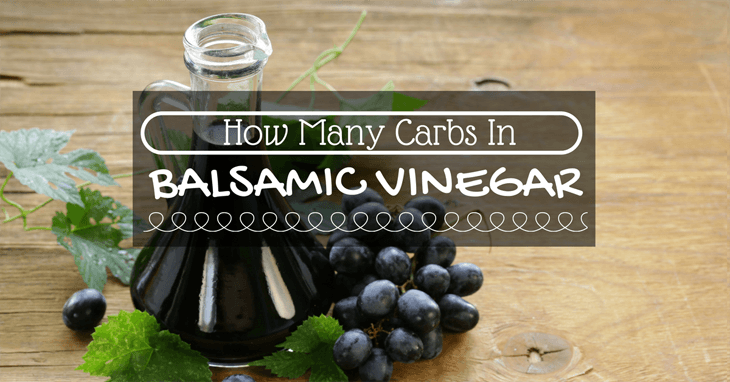 How Many Carbs in Balsamic Vinegar? Many people don't think of condiments as the place where a ton of carbs is hidden, but in this assumption they would be wrong. So many condiments and flavor additives are full of sugar, which are carbs, which add senseless calories and no nutrition to foods. Carbs are known to cause dramatic spikes and lulls in our blood sugar, which causes a whole host of problems. Carbs, especially refined carbs that come from things like white sugar and white flour, have what is called a high glycemic index. What this means is that, shortly after eating these types of foods, you will experience a rapid and sometimes dramatic spike in blood sugar. This leads to all sorts of negative reactions, including that sugar high and crash we are all so familiar with. In addition to the immediate response of the body to high glycemic index foods, these foods have also been linked with weight gain, as well as a difficulty losing weight. Long-term bodily exposure to regular spikes and lulls in blood sugar leaves your body struggling to manage blood glucose levels and also leaves one more prone to the development of Type 2 diabetes. Always look at the nutrition facts labels when selecting condiments. The total amount of carbs and carbs from sugar are listed prominently on this label. You want to stay away from sugar-laden condiments like ketchup, jellies and jams, BBQ sauces that are sweet, etc. These contain a ton of carbs and will send your blood sugar souring along with your weight. Look for products that have less than 3 grams of carbs per serving. There are a ton of low-carb alternatives that give your food the flavor you crave without all the added sugar. Vinegar, like balsamic and cider vinegar, is great low-carb flavoring alternatives, and there are even speculations that these may themselves help us lose that pesky weight. When we change our lifestyle to the better, this does not mean that we want to give up all the foods we enjoy and eat a diet of plain, bland, flavorless food. However, many of the condiments we usually reach for are loaded with added sugar, and thus carbs. It is wrong to think that there are no low-carb condiments, though. There are a ton of low-carb diet-friendly condiments that can be used to add a ton of flavor to your new and improved diet. Vinegar, whether it is white, wine, balsamic, or cider vinegar, packs a lot of flavor into very few calories and carbs. Many types of vinegar, such as white and red wine vinegar, have no carbs at all. More flavorful vinegar like balsamic vinegar contains about 2 grams of carbs per tablespoon. Balsamic vinegar is low-carb approved but considered a “variable carb” which means that some products that have this vinegar in them will be more or less carb friendly than others. All this means is that you should take care to look at the label of the condiment before selecting it to ensure that it falls within the desired range of carbs. Remember, as noted above, hidden carbs and sugars are lurking in many places we would never think to look for them. For many years now, people who are looking to drop a few pounds, lower their risk for the development of Type 2 diabetes, and eat a healthier diet have turned to the low-carb lifestyle. This is a great way to eat better as avoiding carbs, particularly those that come from high-sugar foods that are refined or highly processed, will not only help eliminate a lot of calories from your diet, it will also help eliminate those blood sugar spikes and crashes that many experiences throughout the day. Just because you are avoiding carbs does not mean that your food has to be bland and devoid of flavor. Sugar and refined carbs are, by no means, the only foods that taste good. There are plenty of healthy, low-carb flavorings, such as balsamic vinegar, that add that punch of flavor to your foods that you crave, without adding a ton of sugar and carbs. Balsamic vinegar contains very few carbs per serving but comes with a lot of flavors. This is why so many people look towards vinegar and other similar flavoring alternatives when they begin this lifestyle. I hope that you have found this article useful and understand the problems with refined carbs and how often they hide, unbeknownst to us, in everyday foods. With flavorings like balsamic vinegar, you can adhere to your low-carb diet without sacrificing flavor along with the carbs. This will help keep your foods tasty and fresh, without adding a ton of sugar and carbs to the meal.